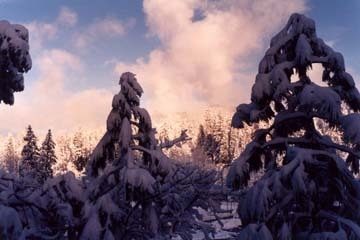 Twain Harte, California is nestled in the pines just off Highway 108 some 10 miles to the east (and above) Sonora. The elevation here averages about 3,800 feet — enough to enjoy something all too rare in California: 4 seasons! Those who live here say it's perfect: high enough to be out of the smog, fog and scorching valley summers; and high enough to offer enough snow in the winter to be scenic, but not overly bothersome. Twain Harte is considered one of California's premier retirement areas. There's plenty to do, though, for all ages. Locals and tourists alike enjoy a round of golf among the pines. There are several scenic lakes with fishing, boating and swimming. Winter sports are big here too: Nearby Dodge Ridge offers great winter skiing. Another interesting to note: Twain Harte is different than many of the other Gold Country communities. While this area, like others around it, is honeycombed with old gold mines, Twain Harte itself is newer than its neighboring Gold Rush-era towns. 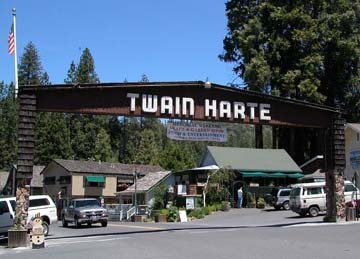 The town was originally named "Twain Harte Resort" in 1924 by Kehtura Wood after her husband's two favorite authors: Mark Twain & Bret Harte. Some of San Francisco's wealthiest families soon discovered this "resort among the pines." Its quaintness and natural beauty subsequently attracted visitors from a much wider geographical area. Today, Twain Harte has a sizeable year-round population but continues to attract a growing number of tourists who quickly appreciate what a special place they, too, have discovered. great swimming in the summer months. ©2007 Ace & Friends. All Rights Reserved.